What Are the Rules for Serving Divorce Papers? A divorce is never pleasant, and it can be confusing to follow all of the legal terms and rules. However, it's important to know how certain procedures should be followed to ensure that the divorce and related legal actions are all within the bounds of the law. This helps you protect your own interests. This includes knowing the proper and legal way to serve divorce papers. Before you serve divorce papers, you have to file certain papers with the court in the county you reside in. These documents are typically called a divorce petition or summons. The divorce papers that are served to your spouse let him know that you have filed for divorce, and these papers must be served correctly. In order for the divorce court to continue, it must know that your spouse received divorce papers and that they were served properly. What Does "Return of Process" Mean in Family Court? Using the Acceptance of Service method, you must have someone over the age of 18 serve the papers to your spouse. Your children, even if over the age of 18, cannot serve the papers. Your spouse must also sign and date the Acceptance of Service notice, agreeing that he has received the divorce papers. You may send the divorce papers via first-class mail, along with a form of acknowledgment for your spouse to sign stating that he has received the divorce papers. It's important that your spouse signs this form, or you will have to deliver them in another way. You may also send the divorce papers by certified mail, making your spouse sign in order to receive the mail. Be sure to ask that the papers are sent with "return receipt requested," meaning you will receive back the paper that your spouse signed in order to get the mail. 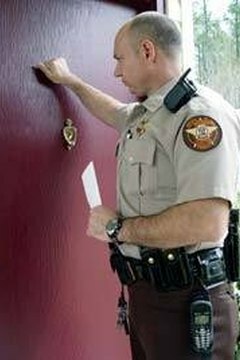 It is often permissible to hire a sheriff to deliver your divorce papers to your spouse. There are also professional process servers that you can hire to do the same thing for you. A form must be filled out by the individual who served the papers to your spouse, including information about the time and date the papers were served, where they were served and other details. This form must be filed with the court to prove that your spouse received the divorce papers. In most cases, if this is the last resort, courts will allow it to be done. Publish the ad for a period of time required by the court in order for the serving to be legal and valid. You may need to ask the judge or your attorney what the correct amount of time is in your state. File the newspaper receipt and information regarding how long the ad ran with the court so it can be proved that this type of serving was legal and valid. Samantha Cummings is a freelance writer with more than five years of experience, and is co-owner of Priceless Writers, LLC. She enjoys writing feature articles, sales letters and blog posts, and is a contributor to several niche websites and 'green' websites and blogs. Cummings, Samantha. "What Are the Rules for Serving Divorce Papers?" , https://legalbeagle.com/5035123-rules-serving-divorce-papers.html. Accessed 21 April 2019.